Hello, Diego Coquillat am and I would like you to join my Club Innovation. I created the first International Innovation Club for hospitality in order to help restaurants to grow and become more competitive through access to the best content and resources that respond to the needs of innovation that the market demands. 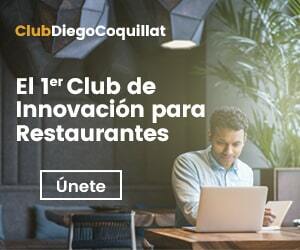 Being a member of ClubDiegoCoquillat is to promote and support a project that focuses on innovation, information and training as the three key pillars to enhance competitiveness and management of restaurants. Will you join my club? We monitored daily for you the main news hospitality sector other media that you can not miss. The best offer specialized courses through online training and webinars that you can find on our platform. Access to videos that Diego Coquillat records for club members with their thoughts and ideas on the restaurant industry. And exclusive access before the rest of readers to the only Spanish digital magazine specializing in lifestyle, innovation and trends for restaurants. Free access to all books and ebooks to publish Diego Coquillat. Get discounts and special prices on the best resources to optimize innovation and digital management of restaurants. Give suggestions, proposes topics of interest, even send your items. We into account the opinion of our partners to create new content and initiate research.